The iTube is a lightweight device that attaches to your cell phone to detect allergens in food. The iTube was developed to address these issues, said Aydogan Ozcan, leader of the research team and a UCLA associate professor of electrical engineering and bioengineering. Weighing less than two ounces, the attachment analyzes a test tube-based allergen-concentration test known as a colorimetric assay. To test for allergens, food samples are initially ground up and mixed in a test tube with hot water and an extraction solvent; this mixture is allowed to set for several minutes. Then, following a step-by-step procedure, the prepared sample is mixed with a series of other reactive testing liquids. The entire preparation takes roughly 20 minutes. 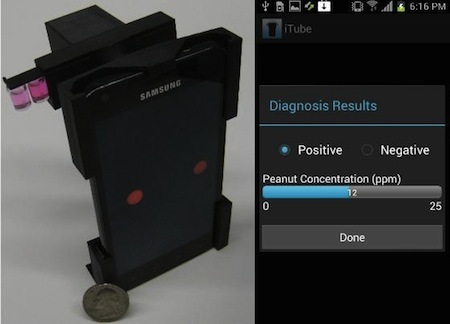 When the sample is ready, it is measured optically for allergen concentration through the iTube platform, using the cell phone's camera and a smart application running on the phone. The kit digitally converts raw images from the cell-phone camera into concentration measurements detected in the food samples. And beyond just a "yes" or "no" answer as to whether allergens are present, the test can also quantify how much of an allergen is in a sample, in parts per million. The iTube platform can test for a variety of allergens, including peanuts, almonds, eggs, gluten and hazelnuts, Ozcan said. ...Paul looked around at the clusterings of guests, the jeweled hands clutching drinks (and the unobtrusive inspections with tiny remote-cast snoopers...). Via Science Daily; thanks to Winchell Chung (aka @nyrath) of Project Rho.